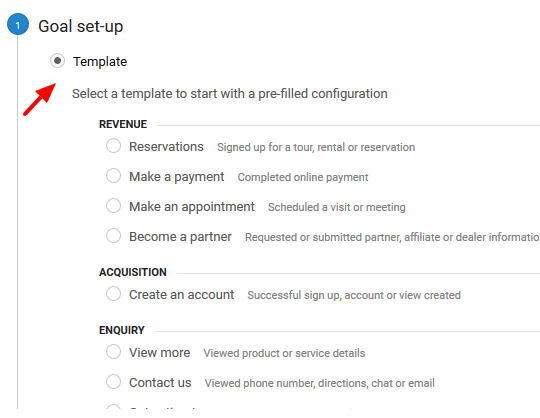 You can setup conversion tracking in Google AdWords or Google Analytics. Analytics conversion tracking is known as goal tracking. And the setup process differs from the AdWords setup. Analytics conversion tracking provides a number of customised templates to help you setup your goal conversions. The templates available depend on the nature of your business and the details you provided when you signed up to analytics. The templates fall under categories such as Acquisition, Engagement, Enquiry and Revenue. Adwords Conversion Tracking doesn’t provide any templates. All you get are 5 category options which are based on the type of action that you’d like to track. One of the advantages of setting up analytics goal tracking is that you don’t have to add additional code for each new goal. You can create up to 20 goals in analytics and you won’t have to add code to your website. With AdWords conversion tracking on the other hand, you’ll have to add tracking code to your site for each conversion you setup. This can be time consuming and is prone to errors. It’s possible that the code can be entered incorrectly at times. It also slows down your website, especially if you’ve uploaded many tracking codes. One of the disadvantages of AdWords Conversion Tracking is that this information will not be available in your analytics reports. 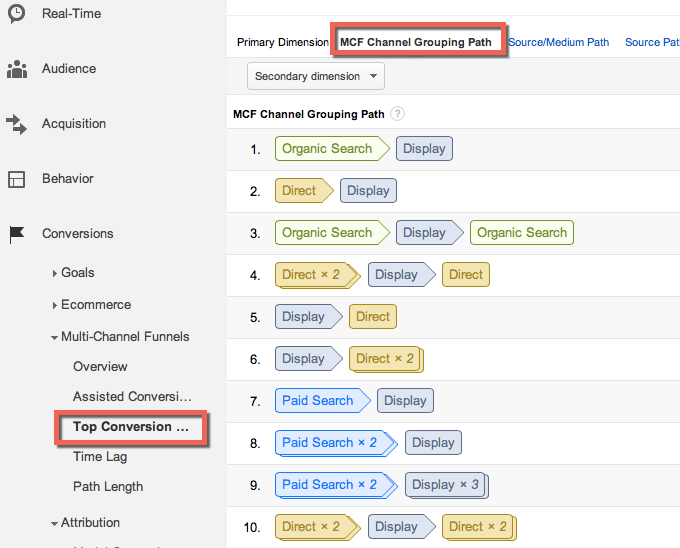 To have conversion data in analytics reports, you’ll need to setup goal or Ecommerce tracking in Analytics. Reporting in AdWords is not as advanced as reporting in Analytics. So if you want more in-depth reporting that includes conversions then you need to set this up in Analytics. One of the major benefits of Analytics goal tracking over AdWords Conversion tracking is the multi-channel reports. These reports reveal how different channels contribute to the goal conversions that take place on your website. This reporting requires goals and Ecommerce tracking to be enabled for the Google Analytics view. Unfortunately you don’t get such detailed reporting if you have only setup AdWords Conversion tracking. Multi-channel funnels help you to see which are your most important channels. Some channels may be great at introducing people to your business but not in the final stages of conversion. So you’ll still want to utilise these channels and use them to raise awareness for your products or services. Overall, analytics goal conversion tracking has better capabilities and provide ps you a lot more info about your business. It saves you a lot of time and helps you easily track actions that you would struggle to track in AdWords alone.